Policymakers, researchers, and the media have periodically raised questions about the ease or difficulty that Medicare patients experience when trying to find physicians who will see them. Previous studies show that the vast majority of physicians accept Medicare, but the proportion taking new Medicare patients is smaller, particularly among primary care physicians compared with specialists.1 Primary care is especially important for people with Medicare—55 million seniors and adults with permanent disabilities—because they are significantly more likely than others to have multiple chronic conditions. This Data Note presents findings on reported acceptance of Medicare patients among non-pediatric primary care physicians, based on data from the Kaiser Family Foundation/Commonwealth Fund 2015 National Survey of Primary Care Providers. In addition to comparing physicians’ acceptance of Medicare to private insurance and Medicaid, this Data Note also explores the characteristics of non-pediatric primary care physicians who accept new Medicare patients and who have greater shares of Medicare patients in their caseloads. This analysis is limited to non-pediatric primary care physicians, given its Medicare focus. The methodology for the survey is provided in the Appendix. 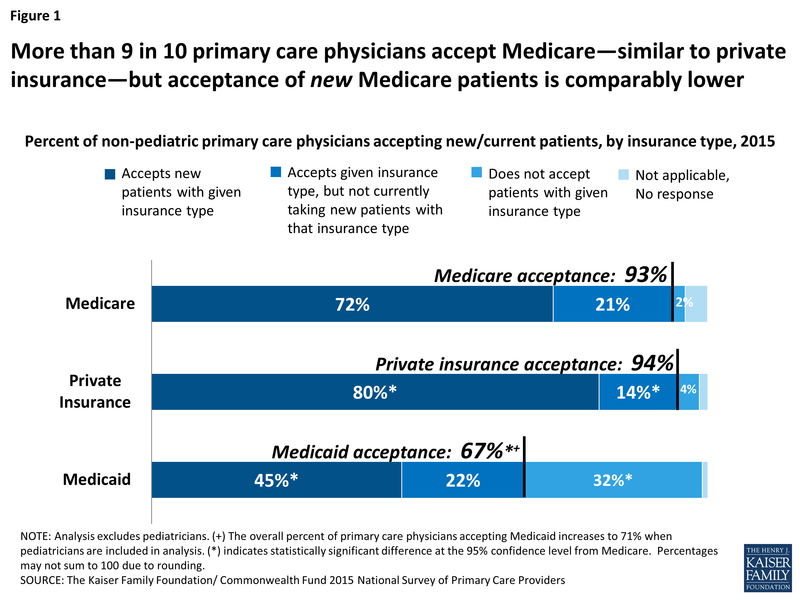 The vast majority of non-pediatric primary care physicians (93 percent) say they accept Medicare—comparable to the share accepting private insurance (94 percent) (Figure 1). A majority of primary care physicians also say they are also taking new Medicare patients (72 percent), but this share is somewhat lower than the share of primary care physicians accepting new privately insured patients (80 percent). Primary care physicians who indicate that they are not taking new patients of a given insurance may have “closed practices,” which means they are not taking any new patients, regardless of insurance. In fact, in a separate survey question, about 2 in 10 primary care physicians (19 percent) report that they are not currently taking any new patients (not shown). 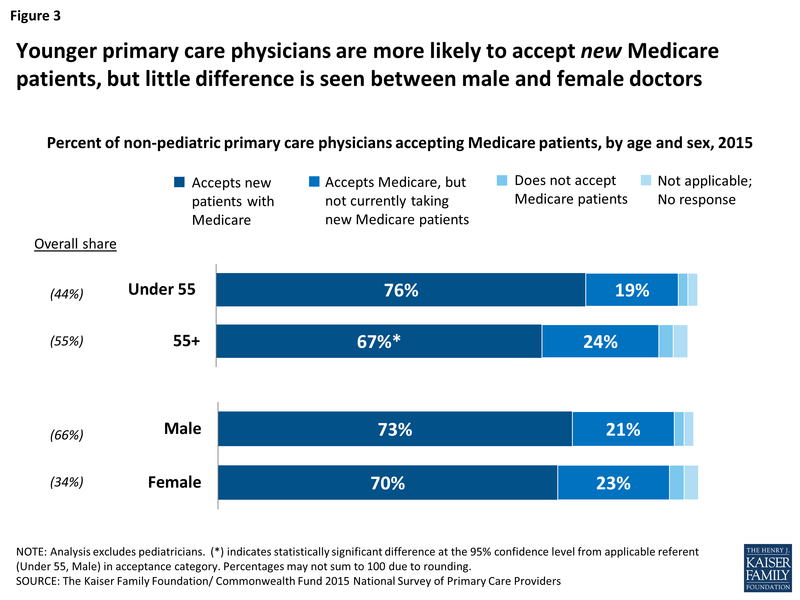 About two-thirds (67 percent) of primary care physicians age 55 or older say they accept new Medicare patients compared with about three-quarters (76 percent) of primary care physicians under age 55 (Figure 3). Younger doctors may be more likely to be building their patient caseloads and, therefore, may be more willing to take new patients. Alternatively, older physicians may have fuller practices and have less capacity to accept new patients. In fact, 78 percent of non-pediatric physicians age 55 and older say they are accepting new patients (regardless of insurance) compared with 83 percent among their younger counterparts (not shown). 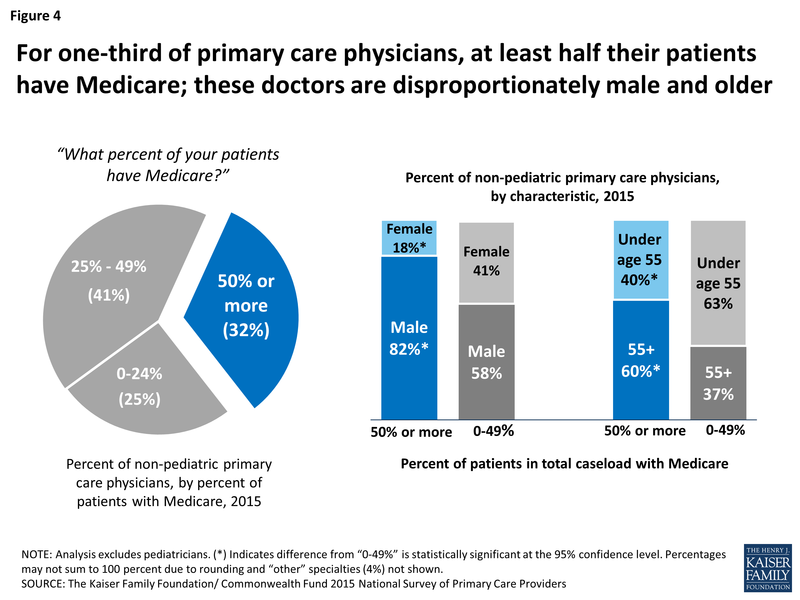 There is little difference between the share of male and female non-pediatric primary care physicians accepting new Medicare patients, though males comprise about two-thirds of the total non-pediatric primary care workforce. In rural areas, a somewhat higher share of primary care physicians (81 percent) report accepting new Medicare patients relative to their counterparts who practice in cities (72 percent), but differences from cities compared to suburban areas or small towns are not statistically significant (Appendix Table 1). 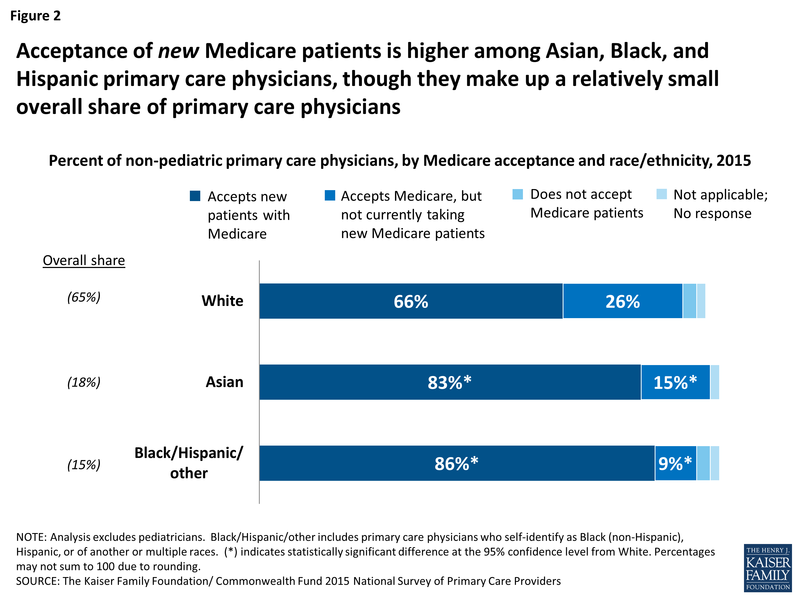 Further analysis by the demographics of physicians’ patient caseloads (income and race, for example), type of practice (such as, hospital-owned or independent practice), does not reveal notable differences regarding acceptance of new Medicare patients. Appendix Table 1 provides these results in more detail. About one-third of non-pediatric primary care physicians (32 percent) say that at least half their patients have Medicare (Figure 4). This cohort of physicians with the highest share of Medicare patients in their caseload is disproportionately male and older. Among physicians for whom at least half their patients have Medicare, 82 percent are male and 60 percent are age 55 and older. In comparison, among physicians with lower shares of Medicare patients in their caseloads, 58 percent are male and 37 percent are age 55 and older. With the Medicare population aging and increasing by about 2 million each year, efforts to monitor Medicare beneficiaries’ access to primary care are critical. In addition to physician surveys, including the one used for this Data Note, patient surveys are useful to draw a complete picture of access to care. In recent years, national patient-level surveys find that the large majority of Medicare beneficiaries report that they have a usual source of care, can find new doctors when they need one, and can get timely appointments, particularly if experiencing an illness or injury.7 Nonetheless, subsets of Medicare beneficiaries—including beneficiaries with no supplemental insurance or Medicaid and beneficiaries under age 65 living with a permanent disability—report experiencing higher rates of problems finding doctors.8 Further analysis of differences between communities across the country may reveal local market-level variation in access to primary care and could have further policy implications for Medicare.